Ski Southwest Colorado – best ski resorts & snow! Your typical Coloradan family ski trip goes like this – land in Denver, drive the I-70 corridor and take your pick of ski resorts, as you pass Loveland, Arapahoe Basin, Keystone, Breckenridge, Copper, Vail and Beaver Creek. Like downhill ducks in a row, we have skied them all. But this time we diverged and discovered amazing new (to us) Colorado ski country. Our 11 day southwest ski safari delivered us to six high-elevation ski resorts, one day cat skiing, 40 inches of new snow, 14 mountain passes, exquisite haute cuisine, and one epic adventure. A morning flight from New England, a quick wardrobe change at the top of 11,990′ Loveland Pass, and we’re skiing Arapahoe Basin by 12:30pm. A Basin has ramped up its lifts with two new quads, the Black Mountain Express on the front side and Montezuma Bowl on the back. Arapahoe’s above tree line terrain up to 13,050′ is legendary as a core Colorado ski area. We hit the jackpot, as patrol opened Pallivicini, a daring double black diamond that drops to the base. Colorado had been in a snow drought, it started snowing on our first day, and kept going during our high-country Colorado tour, with ropes dropping and terrain opening at every turn. Après ski, we drove through Alma, the highest town in North America at 10,578′, by stunning red rock mesas and buttes, to Salida – an artsy, outdoorsy frontier town on the Arkansas River, staying the night at the elegant Palace Hotel before skiing Monarch Mountain. 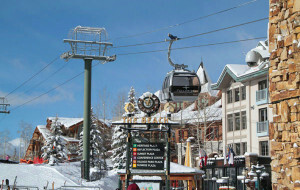 Monarch boasts the highest base lodge in the country at 10,790′ and the highest Starbucks in the world. Monarch is homespun (no lodging or fancy base village – this is the San Isabel National Forest) and heaven on a powder day. Monarch just doesn’t get the swarms (funny butterfly migration reference). If Monarch’s extensive lift served trails and open bowl skiing isn’t enough – you can hike to Mirkwood Bowl or add a day of cat skiing here. Crested Butte loomed large as we arrived, the 12,162′ Peak that pushes extreme skiers to their limits resembles the Matterhorn. From our slope view Elevation Hotel room, we could see powder hounds lining up for first chair warfare well before the bell. We joined the passionate locals, pouncing on fresh powder on CB’s trails, bowls and glades from Silver Queen to Paradise and East River, then dialed it back for an afternoon of cruising Crested Butte’s pleasant Prospect, Gold Link and Red Lady leisurely runs. At Crested Butte, we had the best ski lunch ever at Uley’s Cabin – this cozy mountainside chalet, and outdoor Ice Bar, is an extraordinary epicurean treat at 10,000.’ Crested Butte’s base village is a smorgasbord of big structures (read: not so charming), but lodging at The Elevation Hotel and Spa slopeside at Crested Butte is first rate. Be sure to explore downtown Crested Butte, an historic wild west mining town that brims with cowboy bars, restaurants and cool shops. Telluride, #4 on our tour, was love at first sight for me, from the spectacular San Juan scenery of 14,000-footers, to skiing on 2,000-acres of snowy slopes. Telluride Moun tain provides everything from perfectly groomed to steep to gnarr (serious hike-to bowls and chutes , a posh ski village on the mountain connected to free Gondola to an awesome authentic miner’s downtown. I can see why top skiers and celebs have abandoned Aspen to make Telluride their ski town, its stylish, sophisticated, and the skiing will keep you satisfied for a winter, not just a week. Our snowcat dinner at the highest restaurant in North America, Alpino Vino at 11,960,’ was extraordinary – delicious cuisine served by Alpine dressed waiters in this handcrafted chalet – a former mining claim. Warning: the wines goes straight to your head at this elevated European-style hut. Alpino Vino is also open for ski in ski out lunch inside or on the sun deck with amazing views. Purgatory Durango Mountain Resort was our 6th ski stop. Don’t let the name scare you, this is a super fun, friendly ski resort for families. Durango sports a convenient on-mountain village with affordable luxury lodging at Purgatory Lodge, ski services and a few eateries, at the base of the perfect-sized ski resort on Purgatory Mountain. Durango’s slopes are fun and undulating spreading across 1,360-acres with ten lifts, mostly groomed with a few steeps and natural glades, plus five terrain parks. The locals say you are halfway to heaven at 11,822′ Purgatory, the views of 14,000′ Engineer Peak and The Needles as you ski down certainly bring bliss. Downtown Durango, a half hour drive from the resort, is the real deal – a fun-loving cowboy town with the happiest locals we’ve ever met. 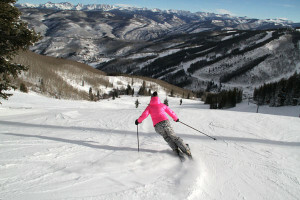 From Durango, you can amp up your powder intake cat skiing for a day with Silverton Powdercats, just a half hour away. Here you ski the huge tenure of snowy Grand Turk Mountain with nine others, your guides and a private snow cat limousine. Our last ski stop, Wolf Creek, promised “The most snow in Colorado,” trademarked for receiving over 460′ annually, and it delivered. This humble 1939 family-owned ski area, closer to New Mexico than Denver, is a haven of groomed sunny slopes plus 1,000-acres of inbounds backcountry-style skiing off an experts’ Alberta Quad. The Wolf has a wild side, but its super friendly and a deal compared to the bigger dogs in the aforementioned Front Range of Colorado. Try our southwest Colorado ski safari, you will be entertained with extraordinary scenery, stunning drives along red rock canyons and snowy 14,000′ peaks, you will ski soft snow at less crowded Colorado ski resorts and enjoy some truly haute cuisine, arguably a little closer to heaven at the high elevation ski resorts of Purgatory Durango, Telluride, Crested Butte, Monarch, Silverton Powdercats, and Wolf Creek.